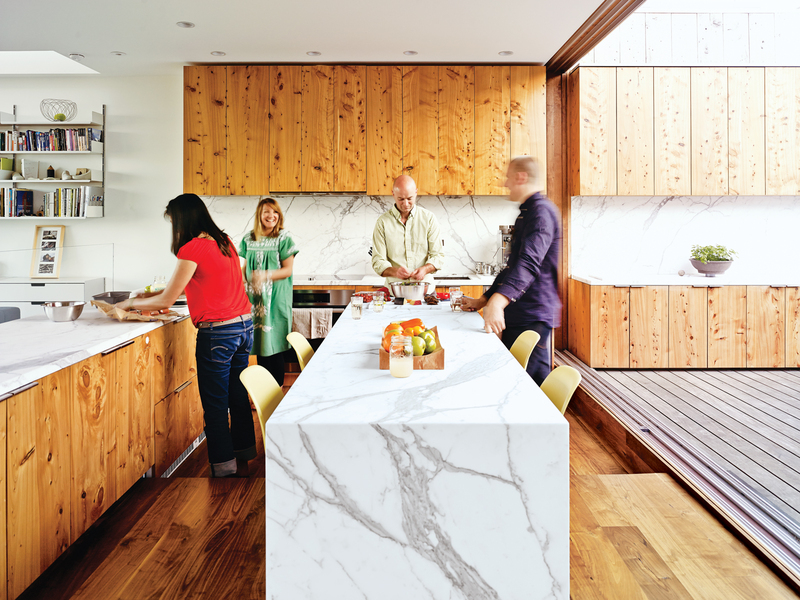 A delicious slab of white Carrara marble, a couple of planks of plywood, and 20,000 Legos: These are among the inventive materials used for some of our favorite kitchen islands from the pages of Dwell. The kitchen of Jan Moolsintong and Peter Russell-Clarke’s house in San Francisco features an island wrapped in white Carrara marble. For this mid-century modern home in Lakewood, Washington, the kitchen, dining, and outdoor space flow around a 12-foot long island—nicknamed “the mother of all islands” by the residents. The renovation on Jerome and Jamie Pelayo’s house in Echo Park in Los Angeles was driven by a very tight budget—hence the island made of plywood.